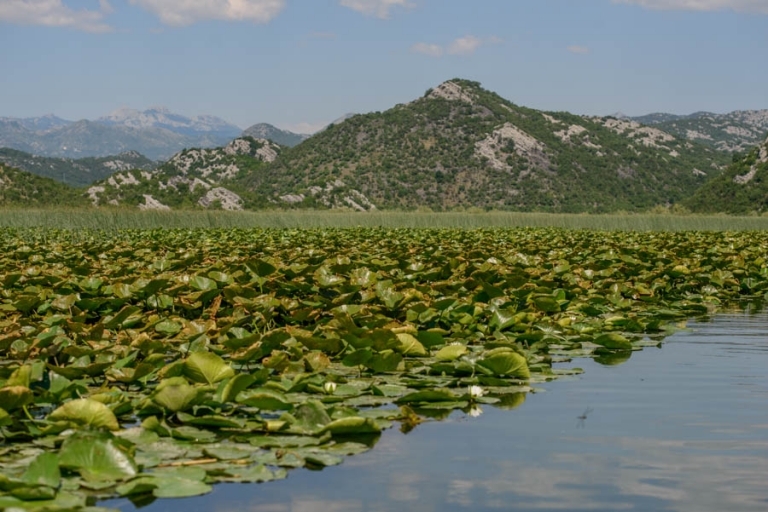 How do you fancy spending a few hours aboard a boat, gliding across the still waters of River Crnojevica Lake Skadar, watching the wildlife on Lake Skadar and taking a small walk up to an abandoned castle overlooking the mountains? It sounded pretty idyllic to us so at 8am we met Mico (pronounced Micho) and set sail. 2 Which route should you take? 8 Watch out for slithery creatures! 9 I want a drone! Home to more than 260 species of birds, traditional stone built villages, islet monasteries and beautiful beaches, the area holds significant importance to Montenegrins who report it as their country’s heart and soul. The Lake has a big history being the battleground for five centuries after the Turks invaded in the 13th century. In WW2 the Lake made history again as Virpazar provided the first Partisan uprising in Montenegro. It was also the choice of summer holiday location for the no-longer Montenegrin royal family and now where some of the best wines and organic food in Montenegro can be found, cultivated by the producers of the Crmnica and Godinje valleys which sit high above the lake. Which route should you take? Mico offers a number of routes around the river and lake that you can choose. 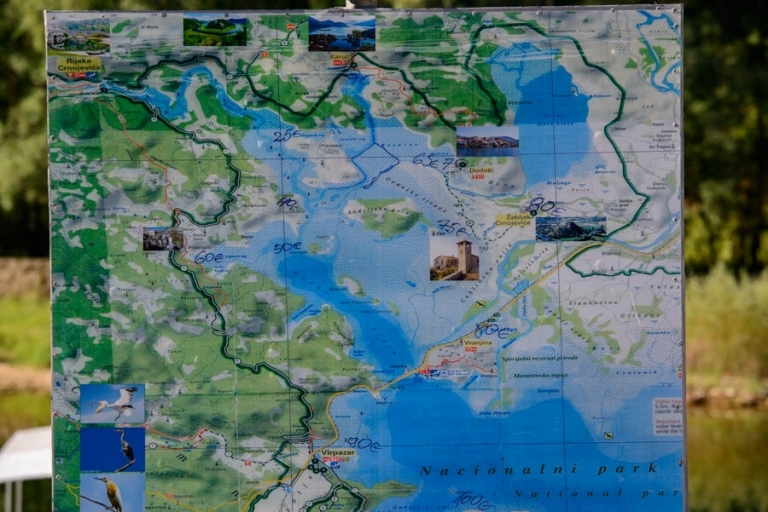 All of the routes start at the town of Rijeka Crnojevica (pronounced sryn-oy-vecha) and we opted for the €80 tour so we could see the majority of the Montenegrin lake and climb up to the old castle. We were gone for nearly four hours. These prices were correct as of season 2017 but they’re obviously subject to change. A map of Lake Skadar (2017). Payment is in cash and in Euros €. Montenegro in the summer months is really starting to attract the hoards in the form of mass coach tourism and after Kotor, Lake Skadar is next on their itinerary! By midday the waterways are full of boats so it’s best to leave at 8am to miss them. Luckily the tourists do not leave from the river, they start their journey from the town of Virpazar. We left at 8am and had the river and lake to ourselves until aboout 10:30am by which time we were already on our way back and even then we only encountered one other boat. Perfection – Thanks Mico! I think it helped that we were in Montenegro between May and June and missed the peak tourist season. We stayed in this little town for a few days and this is where the boat is moored up. Leaving early the sun is already very bright (in the summer months) but the river is still and calm. Great for reflections. It’s also incredibly peaceful and you can hear the faint buzzing of noise from the insects and crickets with the odd jump of a fish. Slightly further down the river you can hear the quacking from the plump of ducks which live there. It’s all really pleasant and relaxing and provokes a big smile! We are big fans of spending time in nature (as you can probably tell) as we think the psychological rewards are incredibly fulfilling and there’s a ton of research to back this up too. Having already been up to photograph the famous horseshoe bend (if you want to know where this is, head over to our post detailing where to go), it was thrilling to sail round it and be the only boat in the water. We headed to the far side of the lake close to the small village of Zabljak so we could find and climb up to an abandoned fortress. At the north-eastern tip of the Lake, at the confluence of the Moraca River sit the remains of an abandoned castle; the medieval fortress of Zabljak. It is believed that this fortress was founded in the tenth century during the reign of the Vojislavljevic dynasty however written testimonies of the fortress only originate from the mid-fifteenth century. The fortress served as the capital of Zeta under the Crnojevic dynasty from 1466 till 1478. Watch out for slithery creatures! Keeping an eager watch out for snakes which like to bask in solitude under the sun, we climbed up the hill, past the cemetery to the long abandoned castle on the hill. If you climb up, take a stick with you and bang it on the ground every 20-40 seconds. Any potential snakes will feel the vibrations and slither off very quickly. The hindrance of having to bang the stick frequently is surely worth it for that view!? We think so. I wish we had a drone!! The view from the top is spectacular and to heighten that view I’d love to see it from a bird’s eye perspective. We always want what we don’t have, don’t we? We saw a gazillion birds and if you’re into ornithology this is an excellent place to see a wide range of species. Some of the birds included cormorants, multiple species of herons, ducks, gulls and terns. I was incredibly disappointed not to see a giant dalmatian pelican but they are apparently very rare to see. If you see one I will be very envious! Mico was kind enough to stop the boat and pick two lillies to turn into necklaces. Montenegro is still quite a ‘traditional’ country where masculinity is measured in macho-ness. Although Mico made a quip about necklaces not being for boys, it was quiet enough for our boy not to hear and he was thrilled with his home-made necklace which smelled divine and came with a free caterpillar. Part of the lake is covered in reeds although there are narrow passages through them. The kids thought it was AWESOME to ride through them touching them as we passed. I was so impressed how Mico made it really fun for them and they thoroughly enjoyed being out on the boat. He would make your trip a brilliant memory to have. 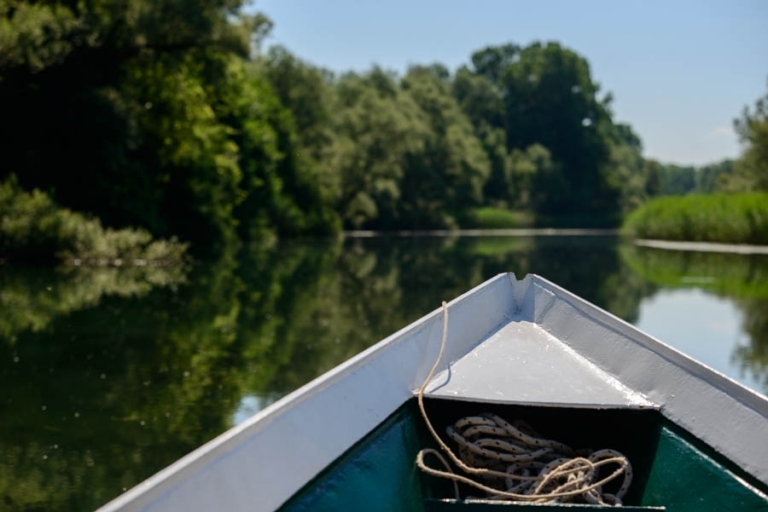 Other wildlife to see on the lake itself include (harmless) water snakes, frogs, toads, fish, butterflies, dragonflies and a plethora of insects and bugs. Sadly our time on the lake was up and we started to head back to the village. You know you’re close to arriving back in the village when you see the two bridges. Mico is incredibly thoughtful and considerate, especially with the kids. He was always pointing animals out to them and stopping to allow them a closer look or for me to take photos. We made some brilliant memories. Montenegro is a beautiful country and being out on the lake really epitomises that. You’re surrounded by the natural beauty of mountains, water and animals not to mention being part of and understanding their history. Trickle down economics doesn’t happen unless we spend money in local communities. Mico is much cheaper (and personal) than the organised tours which start at €250. Sign up for the FREE newsletter with exclusive travel tips and advice. As a small child my favourite book was 'People of the World' which featured Inuits from Alaska, children from China and farmers from Peru. It was a glimpse into another world that would inspire me to wander the globe in search of something special.